Good, bad or indifferent – 2016 is over. And while 2017 is well underway, I recommend content marketers take one good look back before they go. The past is the past, after all. And there’s plenty of lessons from 2016 that we can apply going forward. 1. We’re getting better at this. Good news first: The big story of content marketing in 2016 is that content marketers were considerably more effective than they were even one year earlier, with 62 percent of B2B content marketers and 63 percent of B2C content marketers report that they were “somewhat more successful” or “much more successful” than they were one year ago. 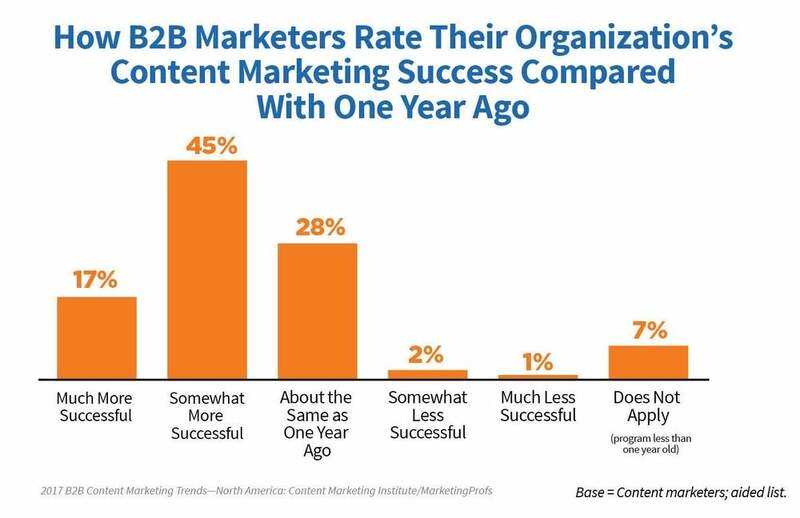 Most content marketers report that they were more successful with their content marketing in 2016 than in prior years. This is clearly great news. It means we can canvas for larger budgets. It also means we can better balance between investing in what works and carefully testing new tactics. Both of which will contribute to us becoming even more effective. How to apply this? Just keep going. Keep testing. Keep refining. Keep checking your analytics and tweaking everything you can. The ROI is out there. 2. Go mobile or stay home. Mobile’s dominance is driven by two mighty forces: Consumer habits and Google. Ignore either one at your own risk. Of course, there’s been more traffic from mobile devices than from desktops for a while. But 2016 seemed to mark the pivot point to a truly mobile-first search experience. You can see this in several major changes Google made over the course of the year. In the rise of mobile-friendly “featured snippets”, which now appear in more and more search results. 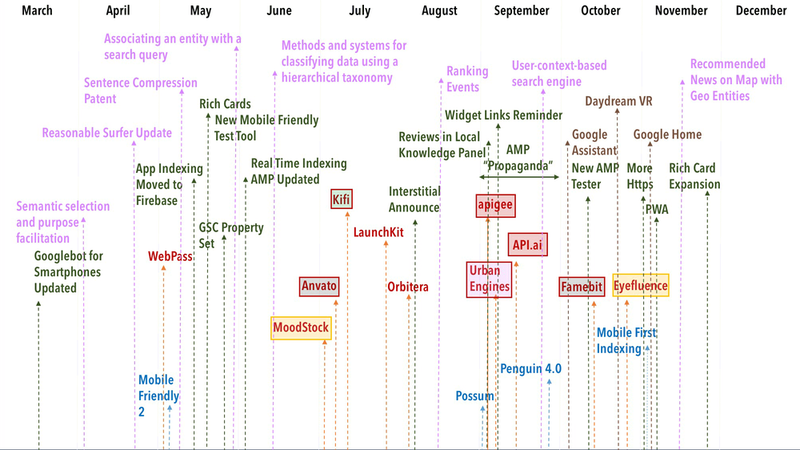 Here is a timeline of the major changes and developments Google made over the course of 2016, courtesy of Gianluca Fiorelli’s blog post, “SEO and Digital Trends in 2017”, published on the Moz blog. Given all these major developments, surely everybody’s caught up and got a mobile-friendly site by now, right? Alas, no, though most sites are now mobile friendly. But according to Clutch.co’s “Small Business Websites in 2016: A Survey," 23 percent of small business websites still aren’t mobile friendly. How to apply this: Get a mobile friendly site. Like yesterday. Already done that? Then look into nabbing more traffic from featured snippets. 3. Email is the best channel to distribute content through. There’s some irony in this one because many small businesses still measure the success of their content based on how many social media shares it gets. But if you really want eyeballs on your content, email is the killer app. Doubt it? 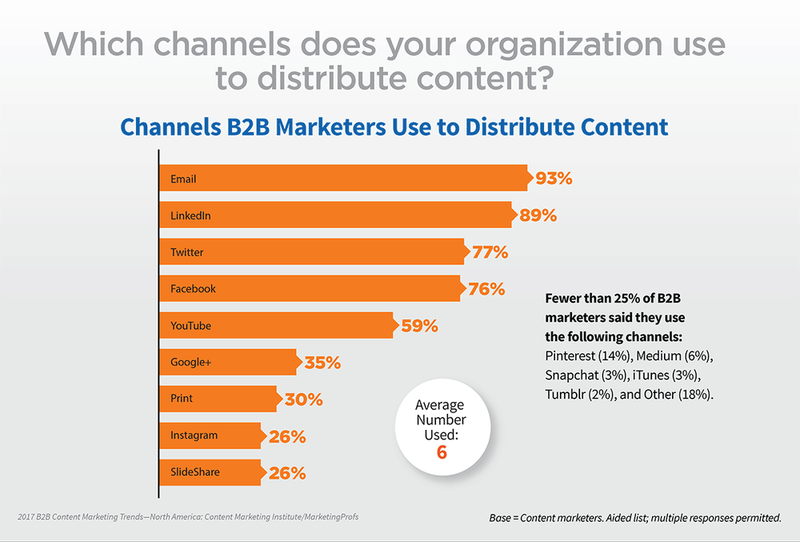 Here’s data point #1: Email is the most widely-used channel for content promotion among B2B marketers. 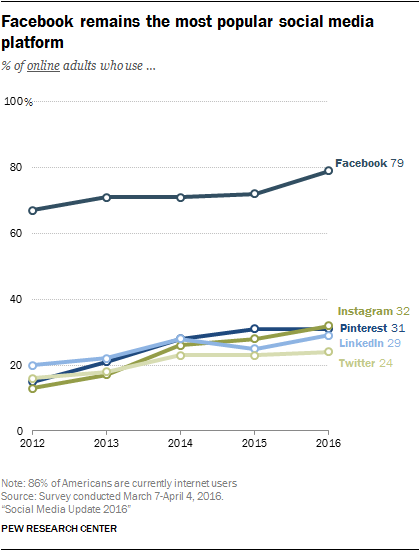 It’s also tied at #1 with Facebook for B2C marketers. Caption: Neil Patel has said he gets more views to his content from his emails than from any other channel. That's 51 clicks versus 1,800 clicks. You go get all the Facebook followers you want. I’ll take the email list. How to apply this: Start building your email list. By the way… I am happy to report that half of all the small businesses we surveyed are already using email marketing. After having a website, it’s the most popular marketing tactic for them. 4. Content relies on trust. I’d rather not light the powder keg of “fake news”, but journalism, publishing, and content marketing have a lot in common. They’re all ultimately about trust. Content marketing works because it instills trust. We build our audiences by creating and distributing useful and entertaining content. Over time, our audiences become very familiar with our content -- they make a habit of consuming it. As that habit becomes grooved, they come to trust what we say. Content marketing works because if people trust you, when the time comes around that they need your product, they’ll think of your company first. They’ll trust your marketing. That’s all content marketing buys you: Familiarity and trust. Content marketing has risen to popularity, in part, because people don’t trust advertising. We don’t do the hard sell (or even the soft sell) in our content because that immediately destroys trust. How to apply this: Be a trustworthy publisher. Check your facts. Catch your spelling errors. Don’t confuse or mislead your audience. Remember: They have a thousand other places to get their content from. It’s all just a click away. Everything you publish should deserve their precious attention. 5. User generated content may be content marketing 2.0. 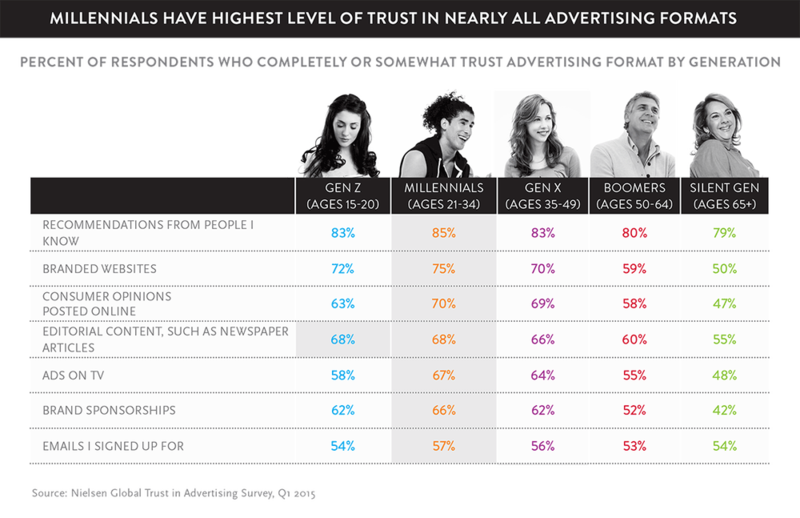 If people don’t much trust mass media, or advertising, or even most branded content… do they trust anything at all? People tend to trust recommendations from other people like them more than any other kind of messaging. This is true around the world and for every age group. There’s more, but you get the idea. This type of content is very hard to control, but it gets major engagement and even conversions if it’s done right. Just make sure your products or services are genuinely great… or you might see some negative UGC crop up. How to apply this: Encourage your audience to share, to leave reviews, or to participate in contests. You might even offer them some incentives to do this. Look at this email request to review an item I recently bought. 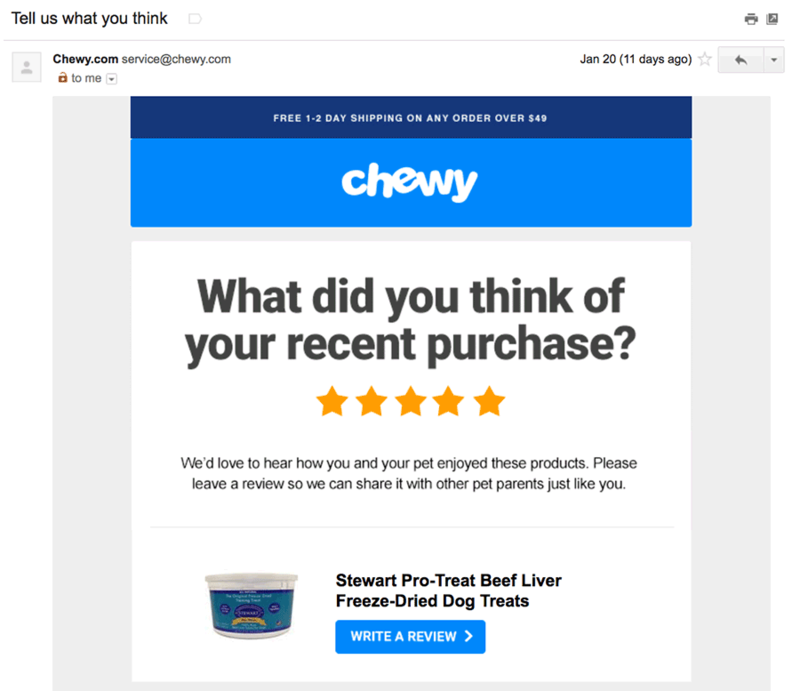 Just one review for a product has been shown to increase sales by up to 10 percent, according to research from Bazaarvoice. Technology comes and goes, but the core connections and interactions between people stay the same. “People do business with people”, as the B2B marketers say. That was true in 2016, and it’ll be true this year and beyond. Our job as content marketers is actually pretty simple. We just have to figure out the best ways to connect to people via the tools and strategies and content that are available to us. Content marketing always has been - and always will be - about your audience. We could just as well call it audience marketing as call it content marketing. You can’t do one without the other.